Greg Smith, Chief Operating Officer of Gilbert Smith Forest Products in Barriere, B.C.—and grandson of the founder of the family-run company—is proud of the resourcefulness the mill and its employees showed in carrying out a major mill upgrade on a tight budget (Photo by Paul MacDonald). A deal with Northern Alberta Métis that involves long-term commercial rights to 200,000 hectares of forestlands is said to be a landmark agreement and could be worth millions of dollars to the community, say its backers. 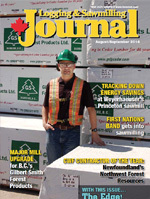 The Gilbert Smith Forest Products sawmill in the B.C. Interior has just wrapped up a multi-million dollar upgrade that included some new equipment, a lot of used equipment—and involved a whole lot of resourcefulness. Weyerhaeuser’s Princeton, B.C. sawmill is seeing some big-time cost savings from a number of energy initiatives the mill has introduced over the last several years—and the operation is continuing to track down energy saving opportunities. Cars made out of …Wood? The BioComposites Group plant in Alberta is very close to bringing its unique product—wood fibre mat produced from refined SPF wood fibre—to industries such as auto manufacturing that are looking for greener materials, and cost savings. Newfoundland logging contractor Northwest Forest Resources—now run by the third generation of the Reid Family—recently added to their award hardware collection, being awarded the Canadian Woodlands Forum’s Contractor of the Year for 2014. B.C.’s Todd Smith is on a mission to photograph and video old logging equipment—and he’s now sharing his work, and the rich history and heritage of B.C. logging, on the Internet at Youtube. The Hupacasath First Nations band on Vancouver Island is now in the small sawmilling business, having purchased a portable Super Scragg sawmill from D & L Timber Technologies, and is looking at other opportunities in the forest industry, including getting involved in logging. With increasing demand for wood products, Nova Scotia’s Consolidated Forest Owners Resource Management stands ready to meet an increase in activity in the woods, with its high level harvesting and forest management services. Included in The Edge, Canada’s leading publication on research in the forest industry, are stories from Canadian Wood Fibre Centre, Alberta Innovates - Bio Solutions, Alberta Agriculture and Rural Development, Forest Innovation Investment (FII), NRCan and the Woodlands Operations Learning Foundation (WOLF). The recent Supreme Court of Canada ruling in the Ts’ilhqot’in Nation vs. British Columbia case could be a game changer for the forest industry, says Jim Stirling. Putting Wood First in B.C. 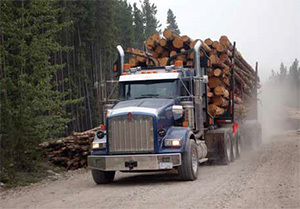 In 2009, a process of intense consultation with the forest sector on the future direction of B.C. forestry culminated in a number of policy decisions that continue to resonate today. Collectively, these decisions were to put “wood first” in B.C. as a means of driving innovation, building demand, and supporting a stronger, more vibrant and sustainable forest industry. The rationale for this direction was straightforward—all British Columbians benefit from a strong forestry sector. After all, forestry touches more communities than any other primary industry in B.C., employs almost 60,000 people and provides the largest share of jobs in the manufacturing sector, and directly supports more than 6,400 local businesses. In terms of total sales, the forest sector generates well over $11 billion annually, making it one of the largest contributors to the B.C. economy. Since the Wood First program was introduced by the B.C. government five years ago, the use of wood in building construction has grown rapidly, particularly in the multi-family residential market and in institutional and recreational buildings. The venues constructed for the 2010 Olympic Winter and Paralympic Games showcased the potential for wood in the non-residential sector in dramatic fashion, with facilities such as the Olympic speedskating oval and the Vancouver Convention Centre serving as central legacies of the Games. And more than 150 mid-rise construction projects are now either completed or under development across the province, up from zero five years ago. These five and six storey wood-frame projects are directly attributable to changes to the provincial building code in 2009 that allowed for taller wood-frame buildings. B.C. was the first province in Canada to make this change. Quebec has since implemented changes to allow for taller wood-frame buildings. Revisions are underway in Ontario, and the national code is expected to follow suit in 2015. Local governments and public agencies across the province are leading by example in using more wood in new building and capital projects. Reflecting the province’s desire to advance a culture of wood use and innovation, dozens of projects featuring wood have been completed spanning all areas of government construction—education, health care, the justice system, transportation, housing, services for seniors, and recreational and community facilities. B.C. is now looking at building even taller with wood to further showcase the province’s expertise in wood design and construction and wood products manufacturing. When completed, the iconic, 29.3-metre tall Wood Innovation Design Centre, now under construction in Prince George, will be the tallest contemporary wood building in North America. Its design reflects an international movement, led by architects and engineers in B.C., to capitalize on advances in wood products and building technologies to build larger, taller structures with wood. These new approaches to building with wood must be tested to confirm that they meet building code and other requirements. Wood First continues funding research to assist building code and other technical specialists in these reviews. Supporting the market for advanced wood building is an expanding base of manufacturing capacity in B.C. for new products, like cross-laminated timber, and a broadening of the skills to design and build with wood. More than 3,000 architects, engineers, designers, builders and regulatory officials have taken training programs delivered through Wood First. On a project-specific basis, technical experts have provided technical support to more than 133 projects, directly resulting in $130 million in incremental wood use in building projects in B.C. The result is enhanced production and design capacity that is establishing B.C. as a global leader in wood products and wood-based building systems. Developers, architects and builders from other countries now regularly contact their B.C. peers for advice, project management, and consulting support. Today B.C. is not just exporting wood products, it is exporting expertise. The wood sector today is supported more than ever by industry and the public. Nine out of 10 British Columbians say wood-product manufacturing is important to the provincial economy and job growth. Some 53 communities across B.C. have adopted their own resolutions, bylaws or policies to encourage wood use in municipally-financed construction. To build on this broad support and the gains of the first five years of Wood First, the B.C. government is investing another $2.14 million this year to further advance the use of wood in British Columbia. Funding is being provided to industry trade associations and research institutions with experience in wood products marketing, training, wood products development and research. The focus of efforts is on expanding the use of wood in non-residential construction, strengthening manufacturing capabilities, and positioning B.C. as a global leader in wood design technologies. The funds are being distributed through Forestry Innovation Investment, B.C.’s market-development agency for wood products. More information is available at the Wood First website (www.woodfirstbc.ca). A five-year report on Wood First is also available from the website. Has increased traffic on your resource roads created unsafe conditions? Do you need help prioritizing where to make road upgrades? If you have aerial LiDAR, FPInnovations can now use it to reduce the cost of our road safety inspection (RSI) service. The new approach leverages aerial LiDAR to analyze stopping sight distance (SSD)—the distance along a road that a driver requires to stop a vehicle safely after seeing an obstacle ahead. When the line-of-sight to a potential obstacle is blocked at a location on the road, the result is an SSD hazard (SSDH). On a resource road, vegetation or surrounding terrain can create SSDHs at horizontal curves (i.e. tight turns), and the road itself can create SSDHs at the crests of vertical curves (i.e. hill summits). FPInnovations’ Resource Roads Group first started investigating ways to systematically identify SSDHs in 2007 using vehicle-mounted mobile mapping systems equipped with LiDAR. This research led to the establishment of our RSI service in 2008. To date, we have delivered RSIs at 12 locations totalling over 1000 kilometres. Our established RSI approach involves going into the field with a contractor who operates a vehicle equipped with GPS, cameras, and LiDAR scanners. Back in the office, the vehicle’s GPS measurements inform our calculations of road curve radii, while the imagery and our field observations allow us to measure road and pullout widths, georeference signs, and view bridge decks and guardrails. The mobile LiDAR, along with vehicle GPS points, become the input for an automated SSDH calculation model. A final report highlights prominent safety issues and is a decision support tool for prioritizing road upgrades. Recently, we evaluated whether aerial LiDAR datasets could consistently identify the same SSDHs as found with mobile LiDAR. Before we could do any testing, we first needed to develop a new automated SSD calculation model, since our existing model runs inside specialized mobile LiDAR software and cannot use aerial LiDAR for this. To test the new model, we found two previously completed RSI sites that also had aerial LiDAR coverage. The density of the aerial LiDAR at one site was 12 hits/m2 and 1.2 hits/m2 at the other. At each site, we ran the new SSD calculation model on a test section and compared results to the model that uses mobile LiDAR. The new model successfully located all prominent SSDHs—even when using the lower density LiDAR dataset. The implications of this evaluation are substantial RSI cost savings if aerial LiDAR is available in your area; FPInnovations can locate SSDHs without any field work, and can complete the RSI by collecting georeferenced imagery and making field observations to inform the remainder of our analysis. We anticipate that this approach to an RSI will aggressively cut costs since it sidesteps the expenses of collecting and processing mobile LiDAR. At the same time, our established RSI service that relies on mobile LiDAR remains valuable—especially if, i) aerial LiDAR does not exist in the region, ii) aerial LiDAR exists but is dated and would not identify current vegetation-caused SSDHs, or iii) collecting mobile LiDAR would also eliminate detailed ground surveys needed for road alignment improvements. Aerial LiDAR has many cost-effective forestry applications such as planning new roads using a derived terrain model, mapping streams and wet areas, and statistically correlating forest plots with LiDAR to produce enhanced forest inventory predictors such as volume and stem size for your entire tenure. Now, another benefit from purchasing aerial LiDAR is the opportunity to utilize FPInnovations’ new lower cost RSI approach. Although there is a capital expense to aerial LiDAR, the accumulating suite of applications and resulting benefits paints a foreseeable future where forestry companies without it will be at a significant competitive disadvantage. For further information about employing LiDAR in road safety inspection (RSI) service, please contact Matt Kurowski, Researcher, Resource Roads, FPInnovations, Matt.Kurowski@fpinnovations.ca, 604-222-5727. 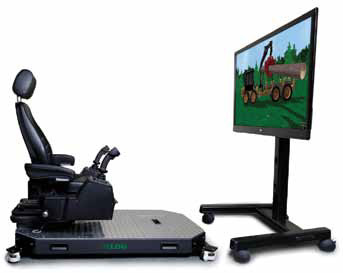 Alberta’s Woodland Operations Learning Foundation (WOLF) has more than doubled the size of its equipment simulator collection by purchasing four new Simlog equipment simulators. It can now offer students many more opportunities to experience what it feels like to operate a larger variety of logging equipment and equipment used in forest products manufacturing facilities. In addition to using the simulators within its own educational programming, WOLF welcomes inquiries from any organization interested in gaining access to the simulators for their own programs, says David Blackmore, WOLF Executive Director. The simulators are intended primarily to help students enrolled in the Alberta Distance Learning Centre (ADLC) Career and Technology Studies (CTS) program accumulate more time as they practice operating harvesting, processing, forwarding, road construction, and equipment used in the mill and woodyards. In addition to the CTS curriculum offered through ADLC, the simulators will also be made available to other WOLF education partners, such as the Northern Lakes College, and to individual school systems that contract WOLF directly to provide educational resources and services. As part of this investment in simulation technology, WOLF is also upgrading the computer and personal computer joysticks for a simulator that travels with the Alberta Forest Products Association (AFPA) Work Wild program. It makes contact with thousands of students in schools across Alberta every year. The simulators allow students to experience operating a harvester processor, bulldozer, excavator, forwarder and for the first time through WOLF—a forklift. They complement two ORYX simulators already in WOLF’s collection, which allow students to experience the operation of a feller buncher and harvester processor. “For the most part, the students are completely involved with the simulators and they can’t believe that an hour has passed,” says Bevan Davidson, WOLF simulator training instructor. The instructor sets out specific tasks that students must accomplish while in the operator’s chair. Davidson says both students and instructors find the simulator’s records management software particularly helpful because they can acquire and evaluate performance at the end of each session and track progress. This is an important feature because a major part of the simulation experience for students is to evaluate if they have the psycho-motor skills needed to operate forestry-related equipment efficiently and safely. This is of great benefit for making career choices. The new Simlog simulators are much more portable, requiring only about 20 minutes to set up, with additional functionality, such as being able to control equipment attachment heads with greater accuracy and in more realistic ways, such as lining up the log butts on a log deck. Most of the Simlog simulators are table-top arrangements, but one features an actual operator’s chair. Simlog is a Canadian company founded 15 years ago with its roots in providing forestry-related simulators to forestry schools in Quebec. Today, it supplies generic equipment simulators to customers around the world. From WOLF’s perspective, having the ability to tap into simulation technology using today’s most powerful computer hardware obviously offers students the experience of operating forestry equipment at a fraction of the cost vs. sitting in the chair of an actual piece of equipment. Blackmore says one reason why WOLF opted to expand its collection with Simlog’s simulators was the affordability factor. The company’s approach is to use powerful, off-the-shelf personal computers (PCs), such as those typically purchased by gamers. He says the combination of using the most current, high performance PC’s and Simlog’s simulation software enhances the overall experience for students. For more information about WOLF, and its resource-related curriculum and services, see the website, https://www.w-o-l-f.ca. It’s all about operating more efficiently and finding new market niches for Alberta’s pulp and paper producers as they face challenges resulting from competition for market share and decreased demand for paper products from the so-called digital workplace. 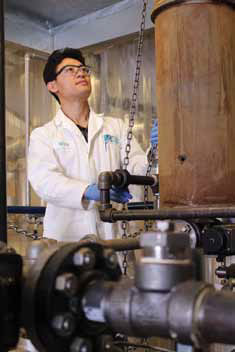 Alberta Innovates Technology Futures (AITF) is a well-equipped, well-staffed research organization based in Edmonton that is ready, willing and able to partner with the pulp and paper industry to meet these challenges. Dr. Benji Ahvazi, AITF’s Forestry Program Lead, has a research specialization in lignin and cellulosic material. Along with other colleagues from AITF and FPInnovations, he visited Alberta’s seven pulp and paper mills last fall to identify their biggest research needs. This tour is now helping to drive AITF’s pulp and paper research agenda. AITF also does contract work for pulp and paper producers as well as lignin users situated outside the province. Ahvazi notes some promising and potentially game-changing research projects at AITF that have recently started, and will build momentum over the next few years. One challenge industry faces is the impact of mixing different feedstock in the pulping process; at present, pulp mills experience fibre loss because each feedstock typically reacts differently under specific mixing and cooking conditions. What AITF has developed under the direction of researcher Keith Lau and in co-operation with FPInnovations is an online, non-destructive, near infrared imaging tool that will allow pulp mills to immediately determine the chemical composition of their wood species mix. This will allow them to build calibration models and achieve maximum yield from their feedstock while reducing their chemical consumption. Previously, it could take weeks to determine this. AITF is also partnering with University of Alberta researchers investigating faster growing hybridized wood fibre feedstock that can grow in this environment to compete with wood species currently grown in such places as Brazil. AITF has both the chemical and mechanical pulping research facilities as well as its near infrared technology to evaluate these species for their potential use for producing pulp and paper products more competitively. There is also the potential to blend wood fibres with agriculture fibres, which AITF can do. Furthermore, AITF is developing a bleaching tower system and expects it to be operational next year. It uses pure oxygen to remove up to 55 per cent of the lignin in pulping fibres, bleaching the fibres so that they can be used in paper, toweling, and tissue. This system is unique in North America because few other organizations have the ability to bleach fibres this way at the demonstration scale. “Companies taking advantage of this system will be able to reduce the use of environmentally harmful chemicals, allowing them to offer greener products and demonstrate their commitment to environmental sustainability,” says Ahvazi. He says that an added benefit to the bleaching tower system is that it can be connected to AITF’s chemical and mechanical pulping pilot plants, which will allow companies to efficiently and cost effectively chop and treat fibre, wash, dry and sort it, and remove the lignin in one continuous process. Speaking of lignin, another promising area under development at AITF is the use of lignin in the production of carbon fibres, which have a variety of potential commercial uses. AITF is equipped with both chemical and mechanical pulping pilot facilities, with the mechanical pulping research lab capable of reducing, washing, and preparing both forestry and agro biomass. Complementing both these facilities is a humidity-controlled laboratory capable of evaluating various aspects of both pulp and paper products against industry standards. In an effort to control the spread of the mountain pine beetle, Alberta forest companies have agreed to give priority to harvesting merchantable stands within their Forest Management Areas (FMAs) infected by the beetle, but there are a number of infected sites with unmerchantable timber being left behind. One concern is that by not harvesting and replanting these stands, and given the number of hectares of these types of forest blocks in the beetle-infected forest, industry could experience a mid-term softwood timber supply shortage due to the mortality of the lodgepole pine in these stands. With support from the Forest Resource Improvement Association of Alberta (FRIAA) Mountain Pine Beetle Rehabilitation Program, the Canadian Wood Fibre Centre (CWFC) has partnered with forest company Canadian Forest Products Ltd., Spectrum Resources and University of Alberta researchers on an operational trial aimed at investigating the most economical ways to recover value and rehabilitate beetle-affected lodgepole pine mixed stands. These are stands with small diameter mixed wood with over 50 per cent mortality. The specific test site consists of seven forest blocks totaling 450 hectares north of Grande Prairie. 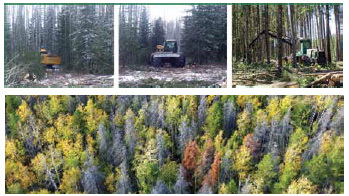 The goals of the operational trial are to establish vigorous stands of lodgepole pine and lodgepole pine/white spruce softwood mix, reduce the present and future stand risk of wild fire and beetle attack, as well as develop and test management options for non-commercial beetle-infected stands. CWFC has assessed the stands and has designed a harvesting pattern that is flexible and can be implemented using a variety of harvesting systems. Using parallel, designated, five metre wide access trails, established at 20-metre centres, the harvester will be able to reach and harvest the targeted stems. The harvested stems are forwarded to a landing where they will be processed, sorted, and then trucked to purchaser locations. These are sites that have been infected repeatedly, so sorts will include green lodgepole pine and infected pine at various stages of infection, from green fibre with pitch tubes to red stage pine and to grey stage pine. “We want to get the beetle off the site so that everything that is green and non-merchantable has a chance to survive,” says Keddy. The goal is also to recover as much value as possible from the sale of the wood fibre to pay for the harvesting and rehabilitation operations as part of the project’s goal of evaluating the cost effectiveness of taking this treatment approach. The productivity of each machine will be monitored, as well as the volume of wood fibre recovered, and the income derived from the sale of the wood fibre. Once established, there is also potential for additional research components studying such questions as the impact of this site treatment on fire risk vs. leaving the site as is, different silviculture treatments, and investigating strategies to decrease the potential for future MPB attacks. The door is now open for forest companies to potentially tap woody biomass and residuals such as leaves and bark for their high value extracts with the launch of the Radient Technologies commercial production plant in Edmonton. 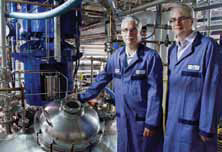 Radient Technologies President Denis Taschuk (left) and Chief Technology Officer Dr. Steven Splinter suggest that forestry companies consider the lucrative extract market as a potential new market for their wood fibre. The company says its “transformative technology” involves novel uses of microwaves to more economically extract valuable ingredients from such natural materials as bark, leaves, wood fibre, crops, fungi, and micro-algae. There is the opportunity to extract ingredients from commonly harvested wood species, wood waste, undergrowth species generally ignored by the forest industry, or to grow new wood species specifically for their extract value. A good example of a high value extract derived from a well-known, existing wood species is the cancer fighting drug, Taxol, which comes from the bark of the western or Pacific yew. Taschuk adds that Radient’s presence in Alberta is extremely important for helping to grow the provincial economy because it provides a commercial-scale world class infrastructure to capture extra value from various forms of biomass, including wood fibre and residuals. Radient Technologies has invested $23 million to develop its technology and build its commercial-scale production facility, which includes a $1.2 million contribution from Alberta Innovates Bio Solutions (AI Bio) through its Advanced Materials and Chemicals Program. The program focused on supporting companies that were close to having a new product or process ready for market. Price adds that AI Bio may either extend or expand the program, given its success. Taschuk says the timing of the financial support from AI Bio was particularly appreciated. “When AI Bio stepped forward, it came in to help bridge our financing. They played a significant role because that support was big enough to tip the scales forward for a number of investors and other funding agencies,” he says. Extracts are used in a wide variety of products including foods, beverages, cosmetics, pharmaceuticals, and health supplements. Initially, Radient Technologies will focus its marketing efforts in these areas. For example, one product they will extract is antioxidants from flax. Some extracts are sold for as much as $10,000 per kilogram. The company’s production facility and industrial scale extractor located at 4305 - 101 Street Northwest in Edmonton can continuously extract from up to 200 kilograms of biomass per hour and is the only one of its kind in the world. The science of extracting ingredients from plant materials is well established. Radient’s technology is much faster and more economical than traditional extraction methods using solvents, it’s more environmentally friendly, and it’s much more versatile. Dr. Steven Splinter, Radient Technologies founder and chief technology officer, says that the microwave extraction method being used by the company is the biggest change in extraction process technology for the industry in many years. In addition to its application to extract valuable ingredients from various forms of biomass, he says that longer term, there is an opportunity to apply the company’s microwave technology within the forest industry’s processing systems. “Clearly, there are some opportunities for using our technology in this way,” he says. The microwave extraction technology used by Radient Technologies was invented by Environment Canada scientist, Dr. Jocelyn Paré. The company purchased the patents and has been working toward ramping up production to a commercial scale. That goal has now been achieved. For more information about the AI Bio Advanced Materials and Chemicals Program, contact Steve Price at (780) 427-2567 or steve.price@albertainnovates.ca. For more information about Radient Technologies, contact Denis Taschuk at (780) 465-1381 or dtaschuk@radientinc.com, or Dr. Steven Splinter at (604) 970-1685 or ssplinter@radientinc.com.